I suspect how you feel about Frank Cottrell-Boyce's In the Forest of the Night will be similar to your feelings about Kill The Moon. Because this is not a science-fiction story, for all its talk of solar flares. This is a fairy tale. 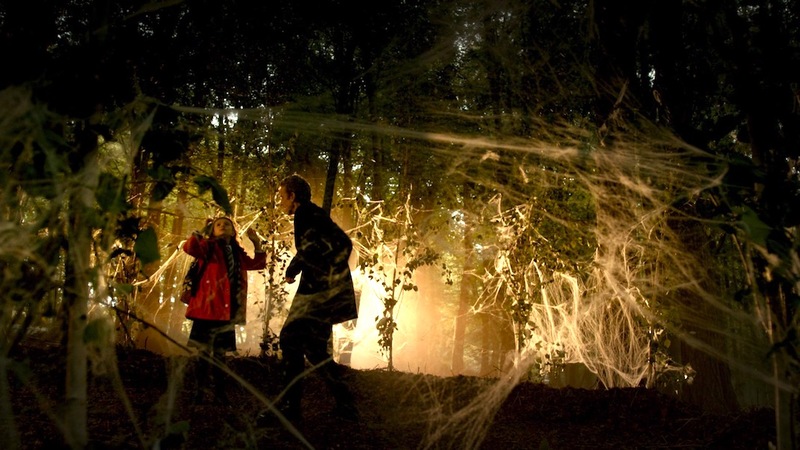 The Doctor's TARDIS almost functions as the witches’ house tucked in the middle of the forest. Except the Doctor is a good witch - or a good Dalek - not a wicked one. There are children. Many, many children. Some of whom, I'm afraid, set off my dislike of child actors. The ones who seem to have walked straight out of some horrific stage school and straight on to my screen. The ones with all the subtlety of a concrete block. However, I found Abigail Eames, who plays Maebh Arden, is reasonably good most of the time. And there, in her name, is a clue to what this story is riffing off: Queen Mab and the Forest of Arden. The role of forests in literature - especially Shakespeare - as a place of magic and fairies. The forests of As You Like It or A Midsummer Night's Dream. The forest perhaps of Robert Holdstock's Mythago Wood too. The forest of myth not the forests of the real world. She is the fairies midwife..."
Which, at a stretch, is a fair description of Maebh's role in the proceedings. Or perhaps I'm trying too hard. However, I'm sticking with the fairy tale thing because it is just so damned obvious. There's Maebh's 'Red Riding Hood' pursued by wolves, Maebh lays a trail for others to follow etc. Analysing this a science-fiction is a mistake but even allowing for that and the long argument that could be had about how much of a science-fiction series Doctor Who is these pushes the boundaries of what is acceptable in Doctor Who. I think the problem I had was hammering the fairy tale into the real world and suggesting trees have saved us before. Or if not the trees then mysterious life force that flitters about like a firefly. It's wishful thinking. And this is a story full of wishful thinking. Maebh isn't ill, she's listening to a different conversation, which is sweet but seems to suggest that not taking your medication is the way to set you free. The trees will save us almost seems to be a prayer about climate change. If humanity won't save itself - which it looks determined not to because it might be a bit hard - then maybe the planet will do it for us. Me, I'm more of a pessimist. I think the planet might have had enough of us. But that's an article for an entirely different time and place. The wishful thinking that a message on every phone in the world from an unknown little girl would somehow stop humanity being stupid. It's a nice thought. I'd suggest the history of the world suggests it wouldn't work. If this story had taken place in the distant past or on an alt-Earth or something, then it might not feel so...wrong. I'm loathed to say anything is 'not really Doctor Who' because that's usually a phrase used by people to write off whole chunks of Doctor Who they don't like, e.g. New Doctor Who. But these teeter on the brink of 'not really Doctor Who' for me. And I hate* myself for even writing that phrase. Having said all that the main reason I didn't particularly like this story was that the Doctor is so stupid in it. It takes him far, far too long to work out what's going on. He starts from the worst-case scenario - an alien invasion - and never really gets himself back on track until right at the end. By which time it might as well have been spelt out in huge letters in the sky. We also get a lot of Danny Pink and Clara relationship stuff, which is fine because I think Samuel Anderson is great but there's something uncomfortable about Clara's dishonesty, Danny's desire to be the ultimate arbiter of what is good and right for Clara and the Doctor's (almost) voyeuristic role. Maybe it is just me. And that's about all I have to say about this story. I'm out of energy and (almost) out of words. I don't hate it enough to wish to write raging prose demanding this be burned from the national consciousness. I don't like it much either. It is, I think, my least favourite story of the season - so far - just because I couldn't quite get on its wavelength, which is odd because I normally have a great love for Doctor Who's stranger children. I suspect I'll have forgotten pretty much this whole story by tomorrow evening. *I don't hate myself really. At least not for that.